Conventional wisdom says Branden Albert, who graded out as the Chiefs' second-best lineman overall, will be allowed to test the open market. 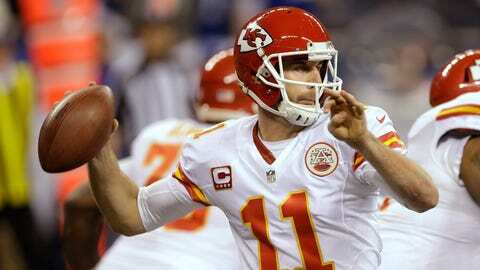 At least one projection slots the Chiefs with $6.89 million in cap room for 2014. But the amount of flexibility, one way or another, probably depends on what happens with left tackle Branden Albert, who played on a one-year franchise tag this season and has been actively seeking a long-term commitment from this club — or any club, really. Conventional wisdom says Albert will be allowed to test the open market; as to whether that’s the right call figures to be one of the loudest off-season debates among the fan base. According to ProFootballFocus.com, the 29-year-old Albert was far and away the Chiefs’ best pass blocker this past season (+14.4 on dropbacks) and graded out as the second-best lineman overall (+10.0) to Geoff Schwartz (+18.6). 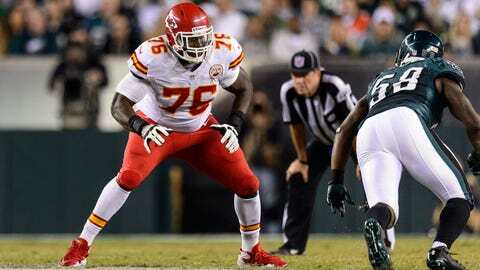 Meanwhile, rookie Eric Fisher’s struggles at right tackle (-17.8) have been well documented. If there IS cap room to work with, it’s safe to assume people will want to play for coach Andy Reid, and they’ll want to play in Kansas City. Despite the temperatures this week, Arrowhead Drive is anything but the NFL’s Siberia. One way or another, wideout has to be addressed. So, too, does safety, nickel corner and adding pass-rushing depth — insurance, if you like — behind the duo of Justin Houston and Tamba Hali. One name that will get a lot of traction locally: Former Mizzou star (and Reid draftee) Jeremy Maclin, who’s recovering from a torn ACL but could be helped by a weak wide receiver crop on the open market. And, hey, Peyton Manning is going to be a year older. Yes, it stings. Yes, your affection for football has withered away. Yes, you’re about ready to string defensive coordinator Bob Sutton up by his shoelaces. But consider this: In Week 17, the Chiefs fielded a "B" team at San Diego in a game the Chargers desperately needed to win, then dominated that Chargers team for three-plus quarters and forced the hosts to have to rally to take it into overtime. The next week at Indianapolis, the Chiefs lost arguably the best running back in football six plays into the game and played the second half without their fastest (and second-best) receiver. They scored 44 points. On the road. At various times over the final six weeks of the regular season, the Andy Gang played without their best tackle (Albert) and best pass rusher (Houston). They didn’t thrive, but they survived. The last two games were an indirect tribute to the scouting and acquisitions of the staff led by general manager John Dorsey, himself one of the key cogs of the Green Bay front office for most of the past decade. They may not know how to manage a clock late in the game, or cover T.Y. Hilton, but the current Chiefs power bloc has an eye for diamonds in the rough. Husain Abdullah was a savvy under-the-radar addition, a special teams whiz who made plays as a nickel back. Ron Parker was in the same mold, and cornerback Marcus Cooper, plucked off the waiver scrap heap at the end of the preseason, was on a clip to be considered NFL Defensive Rookie of the Year before Peyton Manning and Philip Rivers decided to take turns shredding the poor kid. Schwartz, Sean McGrath, Quintin Demps … we could go on. Some pundits have nitpicked the Chiefs’ first draft under Dorsey and Reid as underwhelming, but because of injuries, "incomplete" might be a fairer grade. We have an idea what Knile Davis can do at running back, and in a playoff environment on the road, too, when pressed into emergency duty. We have no idea what tight end Travis Kelce can really do yet, and he was one of the more exciting rookies featured in spring and summer workouts. Defensive back Sanders Commings is an unknown, too. Reid and Dorsey didn’t just find the right one at quarterback. They found the "Right 53" — chemistry-wise, depth-wise — to blend in behind Alex Smith as well. Plus, Peyton Manning is going to be a year older. There’s a program, a proven program here, with a proven head coach at the head of the line. Since 1999, an Andy Reid team has posted a losing record just three times. Whatever you think of Reid in big tilts and late-game situations, that resume­ — the one that’s averaged 9.4 wins over the past 15 seasons — isn’t going to just turn back into a pumpkin overnight. Granted, the road to the next postseason will be far, far more treacherous than this one was. That’s the price you pay for being competitive, the circle of life in the NFL, where parity rules, where the hardest thing to do in the league is be excellent, year after year after year. The Chiefs get to dance with the AFC East and NFC West in the fall, and Tom Brady, Colin Kaepernick and Russell Wilson are different beasts than Tony Romo, an injured RG3 and an aging Michael Vick. Reid’s first playoff team (2000) in Philly won a postseason game. His second (2001) won two. Denver’s championship window won’t stay open forever. And did we mention Peyton Manning will be a year older?